Whether you are looking for something at home that you can sing your favorite tunes on, want a machine for group entertainment at an office party, or are looking for a fun way to entertain your kids this vacation, there is no doubt a Karaoke machine will bring you hours of singing fun. But because there seems to be as many options as there are Taylor Swift fans, choosing the right one can be confusing. To assist you with sorting fact from fiction, we have put together this Karaoke Machine shopping guide, helping you find the very best karaoke machine for you. Children’s Karaoke Machines: these are great value for money karaoke machines designed specifically for your kids. Perfect for travel, they are about the size of a lunchbox with colors and graphics your kids will love. They come with preloaded tracks that you can add to through a USB drive or dvd drive. With their a own screens and user-friendly nature, you can expect to keep your kids entertained for hours with this type of machine. Standalone or All-in-one Karaoke Machines: These karaoke machines are completely self sufficient and include all the features and tools you will need for a fun night of karaoke. Microphone, speakers, volume control, and a lyric reading display are all things a good standalone machine will include, and some even feature additional microphone ports as well as echo, pitch and key controls. With no additional equipment needed, you can roll your all-in-one into any room or out onto the patio for your next family sing-a-long. Microphone or Component Karaoke Machines: These machines are designed to integrate perfectly with your existing home entertainment system. Plugging them directly into your TV, they generally include connections for speakers, televisions, and additional microphones. With some including additional voice recording options, these space savers are a fun addition to any home entertainment area! 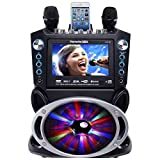 Portable Karaoke Machines: Portable Karaoke machines take all the standard features of a standalone, and compact it into one portable machine convenient enough to take to any get-together or family vacation. An additional feature you may expect is battery power to provide entertainment even when away from outlets. Portable karaoke machines are a great addition to your travel packing checklist for endless fun wherever you are. Professional Karaoke Machines: If you are looking to add a karaoke machine to your pub, open a high-tech karaoke bar, or just want the best of the best for your home, then this is the karaoke machine for you. They are either component systems with a ton of commercial features or all-in-one options with high-quality screens and speakers ideal for an entertainment room. Software-based Karaoke machines: These are apps you use with your desktop computer or laptop to get a karaoke experience. Mics and other accessories are sold separately and they are the ultimate portable options for those singers on the go or for home user with limited space. Sound: Sound is the most valued part of karaoke machines, and no matter what type they have gone for, owners value machines with better quality sound and higher volumes. Choosing a top brand with good sound reviews will help ensure that singers can be heard well and will ultimately give you more satisfaction with your purchase. Controls: Karaoke machines with intuitive controls that adjust volume, voice echo, change songs, adjust display, and switch between audio sources quickly and easily are rated much higher than low quality karaoke machines that don’t either offer these options, or don’t do it as well. Build: Karaoke machines that are not sturdy are not reviewed well. There is a big chance, especially with portable machines, that your karaoke machine will be moved around a lot, and a sturdy build will keep you model safe. Karaoke machines often bring out dancing people and excited children, so choosing a solid durable brand with a good warranty will make sure you get your money’s worth! Storage: Whether owners have opted for standalones, components, or portable devices, they want karaoke machines that can be packed away when the excitement is over and machines that are, are rated much higher. Consider your storage space as well where you plan on using your karaoke machine to choose one that fits well into your home and easy to store when not in use. 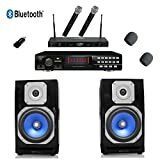 Look for a karaoke machine with good quality speakers (or a speaker input port) for better listening. Karaoke machines are normally between 5 and 300 watts. The higher the watts, the better the sound quality, clarity, and volume will be of your new karaoke machine. Anything under 30 watts is underpowered for most uses. For home use, you will want a machine around 90 watts. For louder and larger spaces, look for a higher wattage unit. Good quality karaoke machines should include a warranty and have a sturdy build that’s strong enough to handle even the rowdiest karaoke party. When deciding on a karaoke machine, consider who is going to use it the most. Machines for kids should be easy to use and entertaining. For adults, you will want a machine with more control options and exciting features. If you are planning on inviting a lot of people around for karaoke nights, you may want to invest in a karaoke machine with better quality speakers so everyone can hear each other while they serenade. Your karaoke machine wouldn’t be fun without music, and machines with extensive music libraries are much more enjoyed. Machines that stream music from a variety of devices, CD, DVD and/or MP3 players and even your smartphone or tablet, offer a lot more song and music variety! 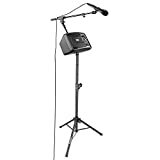 A good karaoke machine should include at least two microphones, pitch control (adjusts the pitch automatically and allows singers to sing at a comfortable level), and voice echo functions. A lot of karaoke machines will come with only one microphone. To make sure multiple family members can sing together or to make it possible to host your own duet competition, look at buying an additional microphone (and make sure your unit will support a second!). ION Audio: ION Audio strives to “bridge the gap between the classic and the cutting edge.” Their USB turntable was the first of its kind, and their karaoke machines are designed to help music lovers become musicians themselves. Karaoke USA: Karaoke USA is a brand of JSK, whose employees have a combined 150 years of karaoke experience. Karaoke USA focuses on making just one type of product - karaoke machines and accessories - to ensure the best quality and latest technology to get you singing. Electrohome: The Electrohome name starts in 1907, when they began selling phonographs and phonograph records. For over 100 years they have been providing consumers with the best in home entertainment products. Their portable karaoke machines and microphones allow you to bring the party wherever you go. MagicSing: MagicSing is a brand of karaoke products from Korean company Enter-Tech Ltd. Their microphone systems allow you to turn any TV into your personal karaoke display.